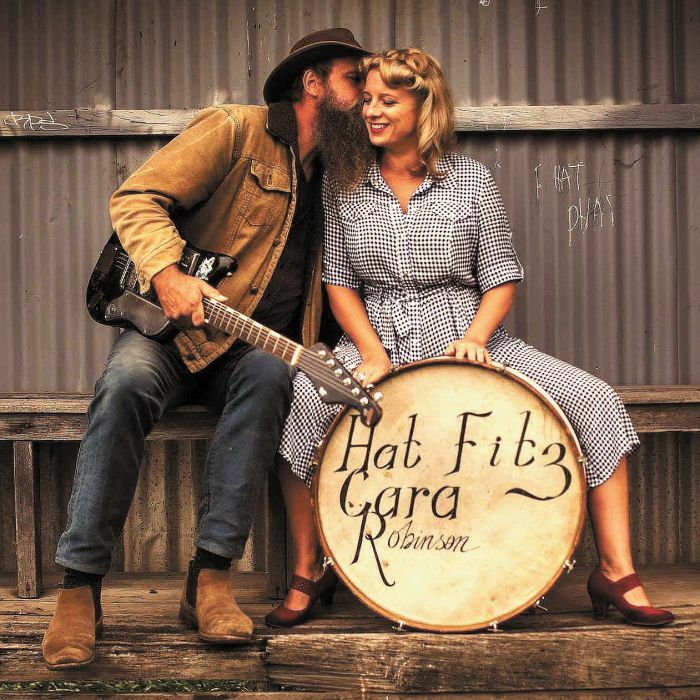 The dynamic duo of blues and soul, Rick “Hat” Fitzpatrick and Cara Robinson, deliver yet another knockout blow on their current Australian tour. Cronulla-born Fitzy with his unique Howlin’ Wolf/Bo Carter/Freddie King inspired persona explores the obscure and the nitty gritty aspects of his life with songs that pay tribute to a well-loved and apparently well-travelled beer fridge (“Do Tell”), his obsession with pre-war blues albums (“Play Something New”), or the trials and tribulations of a touring band (“Stray Hat”). Cara is from the seaside town of Bangor in Northern Ireland and is influenced by Janis Joplin, Nina Simone and Otis Redding. Her songs seem timeless and are pleading with you to “Try” and to “Hold on” or to connect with a mournful immigrant tale about the dearly departed halfway across the world (“After the Rain”). The independent forces that are Hat Fitz and Cara met at a music festival in County Mayo. Not-so-shy Fitzy plucked up the courage to ask Cara for a dance as the last band played the last song on the last night of the festival. Something must have clicked because a few months later she got on a plane, and they have been making sweet music together ever since. On stage they glow with musical confidence – masters of their instruments and vocal powers. The show is peppered with a natural, tongue-in-cheek, married-couple shtick reminiscent of Lucille Ball and Desi Arnaz (sorry I grew up in the ’70s and watched way too much TV). In late July, they will travel to London to record “Hold on” with famed music producer Graeme Durham, who is best known for his work with Bob Marley, Grace Jones and The Chemical Brothers. This song has been the jewel in the crown for me every time I have seen these guys live. “Don’t you know you’ve got to hold on … Don’t you know there’s a place where sweet is the sound.” It’s like an electric charge to the soul. Cara’s booming voice and precision drumming cut to the core while Fitzy’s harmonies and delicate picking carry it across and way beyond the line. If music is your drug of choice then catch their next show, buy an album, download a tune or just check them out on YouTube – they might just make your day.